Since the Edo Period (1603-1867), Chihan’an has been home to the Suganuma family. The Suganuma’s were wealthy landowners, and Nobuko Awaya’s maternal ancestors. 2008 marks the 200th anniversary of their residence at this home. It takes its namesake after “Chihan,” the pen-name of Nobuko’s grandfather, who was a patron of the arts with a special love of poetry. Located two hours south of Tokyo in the tiny town of Ohito on the Izu peninsula, Chihan’an still faces Shimoda Kaido, the famed road taken by U.S. emmissaries in 1854 who had forcibly entered Shimoda port to demand that the Japanese open its territory for foreign trade, effectively catapulting the country into an overnight “westernization.” The area is also well known for the novel “Izu Dancer” by Yasunari Kawabata, a Nobel prize laureate, whose story takes place just a few hours south of Chihan’an. Chihan-an still retains its original footprint amidst beautifully designed modern additions. When entering the large foyer, one’s attention is drawn high up toward the thatched roof interior. From a spacious, contemporary kitchen, the eye can follow dark, gigantic ceiling beams undulating through the house into the room with traditional hearth and ancestral altar, all visible by sliding open the shoji (rice paper) and wooden screen doors. In fact, the vast interior space can be enclosed or expanded by sliding or removing these screen doors and walls. Privately, the Suganuma family gave birth, celebrated weddings, and held funerals here. Publicly, as community patrons, they provided a center for town meetings and important gatherings. As a philanthropist, Chihan invited artists to come for creative retreats, haiku contests, and cultural exchanges amongst one another. Today, we can see some of the work they left behind as a “thank you.” For example, the 91 year old monk , Yuinen left his painting of snake. 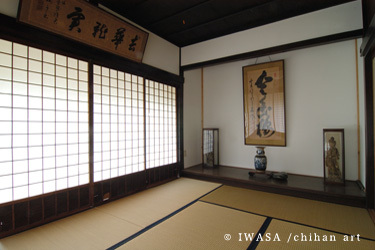 The “an” of Chihan’an, means “retreat” or “sanctuary.” Among Chihan’s guests were such luminaries as playwright Mantaro Kubota, novelist Fumiko Hayashi and filmmaker Heinosuke Gosho. In 2000, Chihan’an was passed on to Nobuko. While there was some discussion about whether to bequeath the property to the state as a historic site, Nobuko decided to carry on her grandfather’s vision: to use it both as a home and a place of creative inspiration. In an interview for the International Herald Tribune, she said: “I didn’t want to keep the house, where my maternal ancestors had lived and where I was born, just as a museum. I wanted to restore its cultural vitality by actually using it…I started thinking of the meaning of the house when my uncle died and I came to take care of the house.” (10/10/08 by Kazue Suzuki). Beginning in 2003, Nobuko began planning the “Chihan Art Project,” an ongoing artist series that includes live-in workshops, performances/installations on site, and the space for good food, drink and company. The first Chihan Art Project event was a music concert featuring shakuhachi player Christopher Yomei, vocalist Mika Kimula, and pianist Ayako Ono on April 14, 2007. In October 2007, U.S.-based dancers/choreographers Roko Kawai and Leah Stein came to begin collaborating with Tokyo artists Hideo Arai (movement artist) and Mika Kimula. The fall of 2008, these three collaborators are joined percussionist Toshi Makihara who is also based in the U.S. Called “IZU HOUSE,” this site-specific dance/sound piece was performed on November 1 and 2, 2008. To see the rest of the events in the past, please visit the Chihan Art Project here above.